To convert WLMP to MOV, you should first know about what's a .wlmp file? It's a project file saved with Windows Live Movie Maker on Windows 8 or Windows 7. It's the successor of Windows Movie Maker, but WLMP is incompatible with Windows Movie Maker whose project files have .mswmm file name extensions instead. Now if you newly ordered a Mac and want to play your created movie in a WLMP file, you have to convert WLMP to MOV first. Unfortunately, Windows Live Movie Maker can't directly export WLMP to MOV video, a third-party video converter program is required to convert the WMV video created with Windows Live Movie Maker. 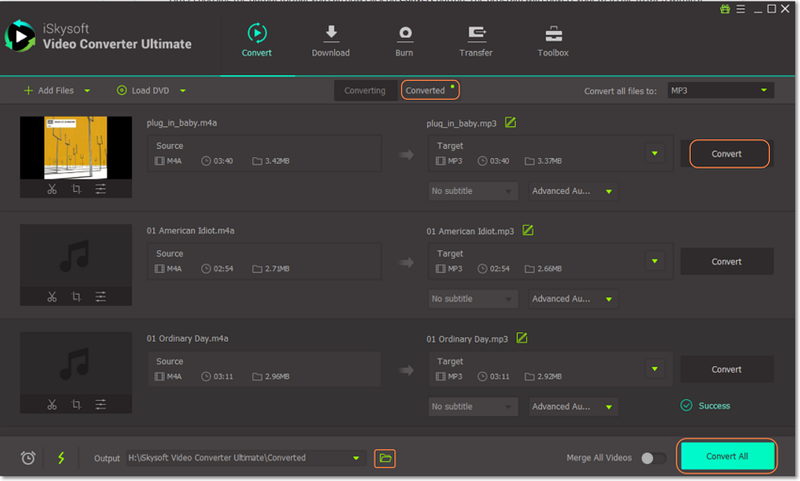 This article will teach you how to save a WMV video from WLMM and then convert WMV to MOV format with iSkysoft Video Converter Ultimate. You can convert up to 150+ different types of video – This is a versatile tool that works with a wide range of video formats. Lossless video conversion – You can convert your video without losing any quality, whether it is from a HD camera or DVD. Save your video to several devices – You can send your videos to several devices using the presets that come with this tool. You can burn to DVD, iPhone, iPad, etc. 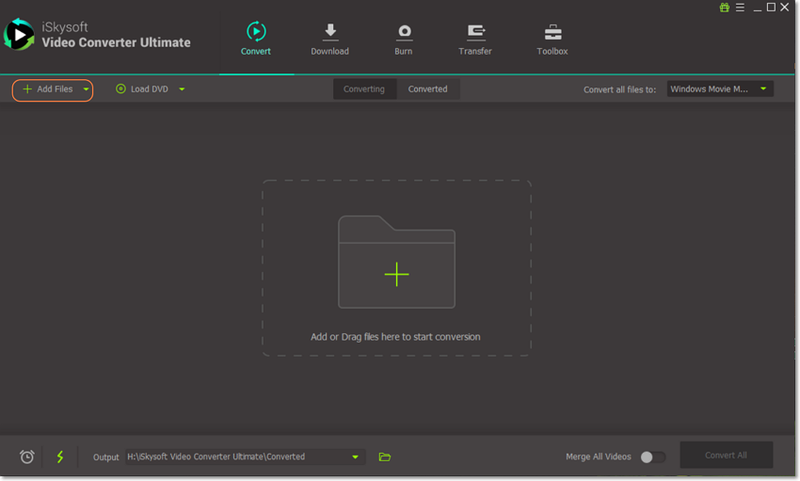 Very fast speed – iSkysoft Video Converter Ultimate is the fastest converter that you can get, with speeds reaching up to 90X. Edit your videos in real-time – Edit your videos as you go along. This makes it easy to see how the final production will be before you send it to the final output. Download videos from several Internet sites – You can get online video and create your own stunning creations. 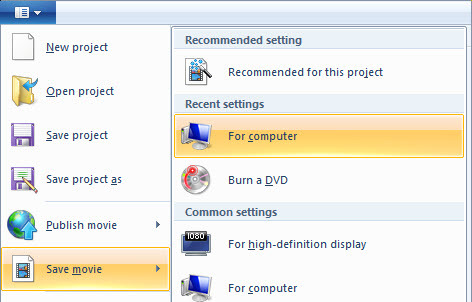 Launch Windows Movie Maker from the Start menu and go to "File" > "Open Project". In the dialog that shows up, find your .wlmp file and click Open. Preview the video to make sure it's what you want, and then go to "File" > "Save Movie" to select an output format. Here simply select "For computer". In a while, a .wmv or .mp4 (depending on the "Save As Type" option) file will be created on your computer. Next, I'll introduce how to convert the created WMV/MP4 format to MOV with iSkysoft Video Converter Ultimate. After downloaded and installed iSkysoft WLMP to MOV converter, launch it from "Start" menu or "Desktop" and then load the created video files to the program. To do so, either drag and drop video files to the main interface of the program, or click the "Add Files" button to import video files. Next, click the "Output" option at the right or click the "Video" icon to bring up the format selection window. Just choose "MOV" from the "Video" category. If you want to change the codec, resolution, frame rate and other video settings, you can click the editing option on the right. Besides MOV format, all popular video formats are supported, including AVI, FLV, MKV, MPG, DV, ASF, DIVX, etc. Finally, click the "Convert" button at the bottom right corner to start WLMP to MOV conversion. All the added video files will be converted to MOV format at fast speed and high quality. You can then play it or transfer to your Mac. Now you know how to convert WLMP to MOV. Also see the questions and answers below or post your question in the comments. Windows Live Movie Maker is pre-installed on most Windows 7 and Windows 8 computers. But if you can't find it, download it at its official website. When installing, you can select to install Movie Maker only or other components like Photo Gallery, SkyDrive, Messenger, etc. Can I convert WLMP to MOV files on Mac? No, since Windows Live Movie Maker is required and it can't run on Mac, you have to first convert WLMP to WMV (MOV is not supported) on Windows first. For the next part, you can convert the created WMV file to MOV format on Windows or Mac. It's up to you. As I introduced at the beginning of this article, WLMP is not a video file so you can't upload WLMP to YouTube. 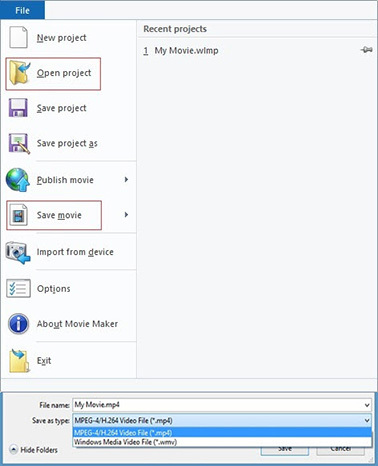 To share your WLMP movie, simply open your WLMP file with Windows Live Movie Maker, and then go to File > Publish Movie to upload your movie without leaving the program. Of course, you can also save movie from a WLMP file and then upload the movie to YouTube. By the way, iSkysoft Video Converter Ultimate for Mac enables you to upload any video to YouTube. Are WLMP files compatible with iTunes? WLMP files are incompatible with iTunes for Mac or Windows. However, by convert WLMP to MOV, you can easily import MOV to iTunes, no matter it's on Mac or Windows. Online Video Converter is one of the widely used online converters that supports various file formats. This online converter provides free services thus accessible by anyone. If you are looking on how to convert a WLMP to MOV then you just need to visit this online tool to convert from WLMP to MOV. WLMP is a movie project which is created on Windows Movie Maker first. You need to save it as WMV format so that it can be played or can be used to further convert using WLMP to MOV converter online. Here, you would need to convert from WLMP to MOV or better to say that WLMP project in WMV format to MOV format using following steps. On Windows Movie Maker> go for File Menu> Open WLMP Project> Save the project as WMV format. Step 1. From the main conversion page, you will be provided with three options using a URL, uploading a file or Brower extension. You just need to choose the middle option "Convert a Video File". Step 2. It will ask to either drop the file or select it> click on the select option. Step 3. A dialog box will appear, choose the desired WMV file and press "Open". Wait for some time till the files get uploaded. Step 4. Once the file gets uploaded, it will ask to select an output format to proceed with converting WLMP to MOV on Mac and Windows. Step 5. Now, out of the given list click on MOV format. Step 5. After that press, the "Start button" to convert WLMP to MOV online. Thus, with the help of online WLMP to MOV converter for free, you can easily convert WLMP to MOV.